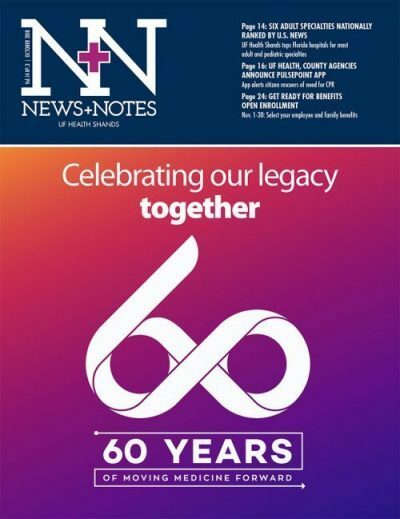 CEO Ed Jimenez shares his perspective in each edition of this News+Notes staff magazine. He also posts on the Bridge intranet homepage under “Leaders Online” and “Leadership Status Updates,” so please visit the portal to check out the latest. This month, we’re focused on the UF Health Shands Hospital system’s 60th anniversary. You came to UF Health as our hospital chief operating officer and executive vice president exactly eight years ago. What attracted you to come here from St. Joseph’s Healthcare System in New Jersey? I was eager to come here because the UF Health Shands hospital system had already earned a great national reputation for providing world-class patient care. I knew that our faculty and staff are committed to supporting the community and serving as an important health care resource regionally and nationally. I value the academic mission, being part a university system that’s making scientific breakthroughs and training tomorrow’s health experts. This is a place where we’re not just making miracles happen every day but we’re helping to advance medicine, change the course of health care and create a better future. This is an exciting and impressive place to put down roots and build your career, and I was honored to come in and help guide the hospital system and support the overall academic organization. We have all this talent and expertise and incredible opportunities to keep expanding what we do for our patients. What challenges excite you about our work here? Like I said, the fact that we don’t draw from a metropolitan area, we think much more broadly. We absolutely have to think how we can draw patients from all over the state and throughout the Southeast. Second, our great medical school is continually on an upswing and the hospital participates in the growth of the medical school and all the research we’re doing. We really have to be a resource for the state, focused on patient care, training, research and community development. These are exciting challenges. What’s your vision for the future; what goals lie ahead? The future is about continuing to innovate and improve patient outcomes, supporting the College of Medicine advances in clinical and translational science and taking research discoveries to patients faster and more efficiently. A great example is the NIH grant ($12 million) the college received in 2014 for sepsis and critical illness research, stemming from our sepsis research program and the efforts by our surgery colleagues. The college-hospital collaboration is what sets us apart. We’re going to have continued partnerships with other hospitals and health systems to demonstrate how we can provide even better care, connect with our communities locally and beyond and take health care resources where people need them. UF Athletic Director Scott Stricklin awarded UF Health Shands CEO Ed Jimenez a commemorative jersey at the Sept. 8 football game as part of UF Health Shands Hospital’s 60th Anniversary celebration, and in honor of the care team who gave patient Nikia Ingram a second chance at life. (From left) Daniela Hofacker, R.N., EMT-P, UF Health ShandsCair flight nurse; Thomas Beaver, M.D., M.P.H., UF College of Medicine thoracic and cardiothoracic surgery chief; Mauricio Pipkin, M.D., UF College of Medicine thoracic and cardiovascular surgeon; Scott Stricklin, UF athletic director; and Ed Jimenez, UF Health Shands CEO. You visit with each new employee orientation class and give an introduction about the system. What common traits do you see in our new hires? Our new faculty and staff also want to be part of something special. They will get to see the way we provide lifesaving treatments, give empathy to families and make a difference in moving medicine forward. They’re excited to feel part of it by experiencing it firsthand. You can think of a teaching environment as intimidating and exciting — and soon it becomes personal. We are all part of what’s special here. It’s our hospital system’s 60th anniversary. We have many staff who have been here decades and feel part of the legacy. You’re still relatively a newbie! How do you feel about this milestone? Whether you’ve been here 20 years or one year, you’ve participated in changing lives! We keep improving outcomes, offering more services, taking care of more people in more convenient locations with the same quality service and caring compassion. Stick around for more remarkable discoveries. When our (15,000) people are united to help others, amazing things happen. When we think about our co-workers, we’re a family. We spend lots of time together, we’re going to grow together, celebrate work and personal triumphs together and even cry together sometimes. You’re not treated like a number, and this isn’t a factory or a for-profit business focused on the bottom line. We’re together as a family, making a difference for patients and each other. We need to treat each other the way we treat our patients. If you do this right, you create a family environment for everybody. This way, we lift each other up to do our best work. All the right ingredients are here and it really is awesome. For this major anniversary: Stop a moment, take time to reflect on what YOU have personally accomplished here. You do things every day that may not always be recognized by others, but everything you accomplish for us is important. Thank you! Take time to reflect on your part of this bigger picture. You’re appreciated. Have a Question for the CEO? Email Kim Rose, director of strategic communications with UF Health Communications, at roseka@shands.ufl.edu and she’ll share your question with Ed Jimenez for an upcoming CEO column.